AG RINCON CRIOLLO is one of those places where you don't really expect much of it. However once yore inside conversing with the staff and eating the food you realize its absolutely amazing. Many people have mixed feelings about different pizza parlors here in New York and at times that can make it hard to really crown New York City's finest. Wow, this stuff is pretty cool and pretty useful, definitely need to try these things out of you live alone! INTERESTING FACTS ABOUT AMERICAS FAVORITE FOOD. The Best Damn Hot Dogs In New York City. During my second semester in college i was reading a lot of newspapers, primarily New York times and the wall street journal. One night i came across an article about a new restaurant opening in Lower East side of Manhattan. Los Perros Locos. After reading i immediately wanted to check this joint out. It was a Colombian Hot Dog Joint, and most people would argue with me that it was just like " La Perrada De Chalo " in Jackson Heights, NY or like Papaya King. They were wrong, very wrong. This place immediately became my favorite place to eat in New York City, more than Juniors Cheesecake. 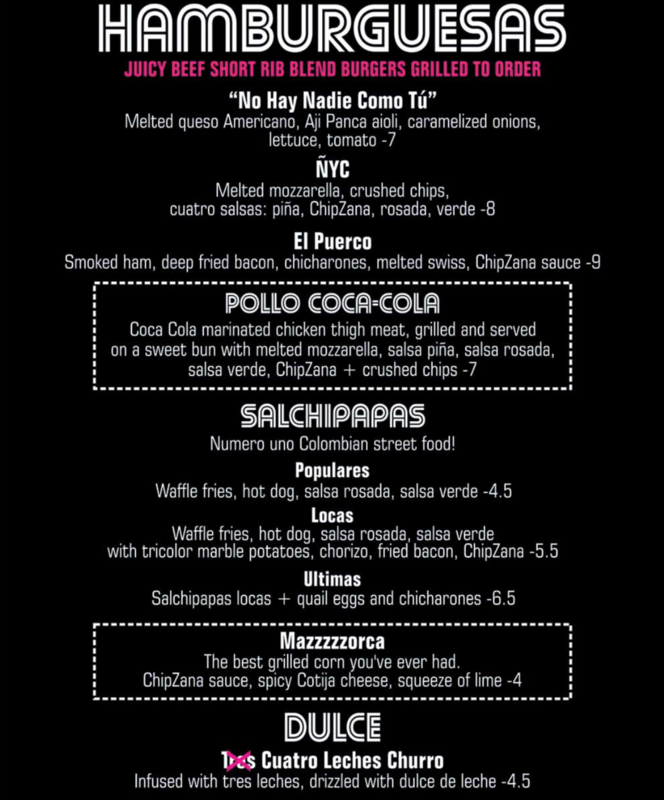 MELTED MOZZERELLA, CRUSHED CHIPS, CUATRO SALSAS: PIÑA, CHIPZANA, ROSADA, VERDE. I would take mine Medium well with a side of Salchi-Papas which are bits of hot dog on waffle fries and LPL special sauce. Wash it down with a nice Postobon Apple Soda-pop, all for about 15-16$ a premium price to pay for LES, but well worth it. I mean i would drive 35-45min just to eat at this place. Sad to hear it closed down in August of 2014 😔. Through out my blog you'll read a lot of stories of my adventures in Montreal, QC. Ive been there a lot, and I've done A LOT... you'll get used to it. At least until i get the opportunity to visit other cities around the world. Anyway, i wanted to personally give credit to what i believe is possibly the BEST BAGEL in North America. I say that because i have had bagels from New York, Boston, Atlanta, Las Vegas, Los Angeles, Orlando, Washington D.C and a couple of places on Long Island. Yes, each city has its own specialty bakery shop or bagel shop that has some sort of unique bagel that will make you think twice, and even though New York is known for having some of the best bagels around, i promise you that these bagels in Montreal are definitely worth a try. A definite argument will arise, especially when speaking with Montrealers on this topic. Personally i was under the impression that St. Viateur was the best bagel, that is until i asked for directions 😐. I was pretty much verbally attacked... In french... and was told to visit Fairmount Bagles. Luckily these two shops sit very very close to each other ( 3 min drive, 10 min walk, if you walk slow). So why not try both? i did, i had my heart set on St. Viateur, so i went there first and picked up Half a dozen ( luckily they spoke english, my french is not the best ). I really like the layout of this shop, you can see the workers making the bagels right there and they have a very old school traditional way of making them. 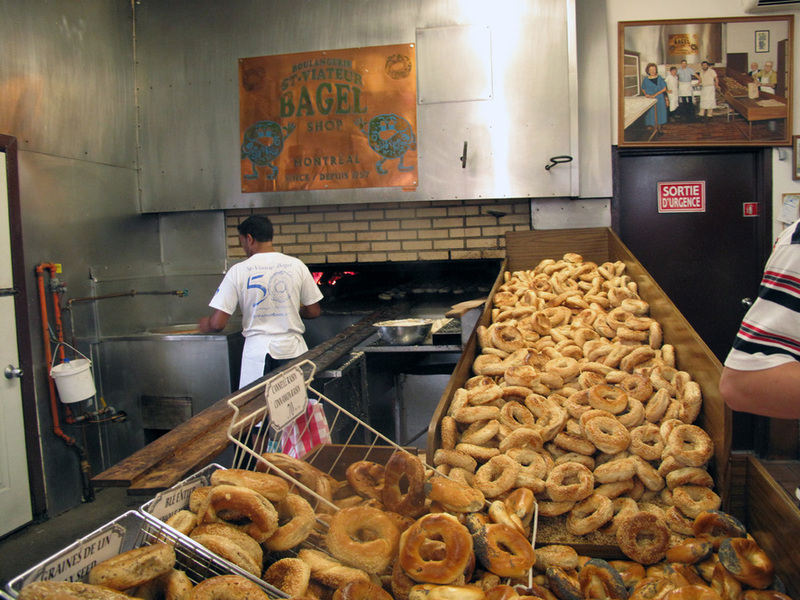 Ok, next comes Fairmount bagels, so i head over there which took like 2 min. upon walking into the store, i wasn't too excited about the layout of the store, i preferred St. Viateur because it has a more nostalgic feeling to it, but Fairmount did have a much larger selection than St. Viateur, But for the sake of comparison i stuck to the same Sesame Seed one i got over at St. Vs. I purchased half a dozen and made my way over to my cousins house in Laval, where i was staying. It was about a 15-20 min drive and i absolutely could not wait, i bit into the St. Viateur Bagel first and "Oh My God"... i destroyed that bagel, i wanted another but i had to try the Fairmount first, so i did, and "WOW". Fairmount bagels were really good, almost the same as the St. Viateur to be honest, however if i really had to pick one, my personal opinion is that the St. Viateur is the absolute best one in Montreal, and quite possibly all of north america. Philly Cheese Steak - Who Is South Philly's Finest? Philadelphia is the 5th largest city ( By population ) in the united states and the largest city of the state of Pennsylvania. It is well known for rich american history that have shaped the United States into the country that it is today. Filled with museums and Historic buildings including the site of the signing of the Declaration of Independence by our founding fathers. However there are many other things Philadelphia is famous for, and one of them is Philly Cheesesteaks 😎. You can visit Philadelphia for many things and then stop by one of the famous Cheesesteak joints in south Philly when you're done or you can be spontaneous and crazy like myself and take a 2.5 Hour drive from New York just to try one of these bad boys. Now of course i did some sightseeing while i was there, i figured why the hell not? but lets get to the point. The two most popular Cheesesteak joints are right across from each other, they are Geno's and Pat's King Of Steaks. Both Restaurants sit at 9th Street & Passyunk Ave in Southern Philadelphia and have been long time rivals. Pat's Steaks claims to have invented the sandwich back in 1933, Geno's has been in business since 1966, and both restaurants claim to sell over 3,000 sandwiches on a busy day. Now on a busy day you can expect to wait up to 30 min maybe even more on line ( i waited about 35 min ). Unfortunately i can't eat 2 footlong Philly cheesesteaks like some people i saw jumping from Geno's to Pat's just to see which is better, and even if i could've just ate half and then tried the other half at the other spot, it was still too much work for me. However i gotta say i found Geno's to be a bit cleaner and better lit which made my experience just a little bit better than Pat's, but needless to say both restaurants were good, and it was well worth the drive. Ill leave it up to you to decide which one you think is best.